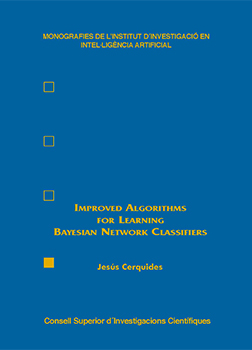 This thesis applies objective Bayesian probability theory techniques to improve Bayesian network classifiers. The main contributions are: ─ A parallelizable distance based discretization method that allows to extend discrete classifiers to non-discrete domains. ─ The concepts of qualitative influences and synergies, which allow to improve understandability of Bayesian network classifiers. ─ The first order and second order qualitative Bayesian classifiers, which are classifiers based on qualitative influences and synergies, with easily understandable results and with a reasonable accuracy. ─ INDIFFERENTNB, an improved version of the naive Bayes classifier based on the naive Bayes model, naive distributions, Bayesian model averaging and the principle of indifference that improves the quality of the probabilities of the maximum likelihood naive Bayes classifier. ─ STAN+BMA, a classification algorithm based on applying empirical local Bayesian model averaging to the stan (softened TAN) classifier and which improves its accuracy. ─ TBMATAN, a classification algorithm based on the computability of the averaging of TAN models under decomposable distributions over TANs and the principle of indifference that improves stan accuracy. ─ SSTBMATAN, an efficient approximation to TBMATAN which provides also improved accuracy. ─ MAPTAN, a classification algorihtm that computes the maximum a posteriori TAN model and improves STAN accuracy. ─ MAPTAN+BMA, a classification algorithm that computes the k maximum a posteriori TAN models and their relative weights efficiently and improves STAN accuracy and STAN+BMA accuracy and learning time. These results show that the joint application of Bayesian model averaging and a careful selection of the prior probability distribution over the set of models, following objective Bayesian techniques whenever it is possible, can provide significant improvements to classification algorithms. Este título está en nuestro catálogo electrónico desde el jueves 01 octubre, 2015.